Volcanic forces created the dramatic landscapes of the Volcanic Plateau. Māori have long taken advantage of the lakes and geothermal areas, with their hot steam, bubbling pools and distinctive sulfur smell. Since the 19th century, tourists have been drawn to the thermal activity near Rotorua, trout fishing around Lake Taupō, and the high volcanic peaks of Tongariro, Ngāuruhoe and Ruapehu. The Volcanic Plateau stretches south-west from the Bay of Plenty coast to Mt Ruapehu in the central North Island. Rotorua and Taupō are the main towns. The plateau is New Zealand’s main area of volcanic activity. There are hot pools, steam vents, bubbling mud and geysers, especially around Rotorua. Lakes fill the craters left by huge volcanic eruptions. Lake Taupō is New Zealand’s largest lake (623 square kilometres), and there are many lakes near Rotorua. The volcanoes of Tongariro, Ngāuruhoe and Ruapehu are the North Island’s highest mountains. Māori arrived in the region from about 1300. They settled around the lakes and geothermal areas, where they could use the fresh water, hot pools and steam. Ngāti Tūwharetoa, around Lake Taupō. Both are descended from the people who came to New Zealand on the Te Arawa canoe. From the 19th century, tourists visited the geothermal areas – especially the Pink and White Terraces, lost when Mt Tarawera erupted in 1886. The government built a town at Rotorua for tourists to stay in. Māori often guided visitors around Rotorua’s thermal areas, especially Whakarewarewa, and Māori concert parties put on shows. Bathhouses were built so people could soak in hot pools, which were thought to cure sickness. In 1887 the Tūwharetoa tribe gave Mts Tongariro, Ruapehu and Ngāuruhoe to the Crown. They became Tongariro National Park – the country’s first national park. 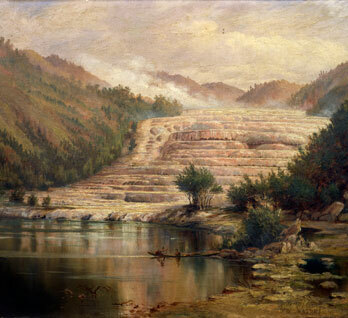 Trout were put into the lakes and rivers, and fishing became popular. Many people visit the lakes in summer and enjoy swimming, boating and relaxing. Non-native pine forests were planted from the early 20th century to provide timber, especially on the Kāingaroa plateau. When Europeans first tried to farm the Volcanic Plateau, their animals became ill. Scientists found that ‘bush sickness’ was caused by a trace element missing from the soil. When fertiliser was added, farms could be developed. Geothermal energy is used to make electricity at Wairākei and Ōhaaki. The Waikato River has been dammed to produce hydroelectricity, forming a number of lakes, and the Tongariro power scheme diverts river waters through tunnels to produce hydroelectric power.